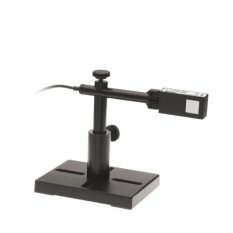 The PD300 is a general purpose photodiode laser measurement sensor with swivel mount and a removable filter and has a 10x10mm aperture. Without filter, its spectral range is 350 – 1100nm and its power measuring range is 500pW – 30mW. With filter the spectral range is 430nm – 1100nm and the power range is 200µW – 300mW. It has the exclusive Ophir automatic background subtraction feature. The sensor comes with a 1.5 meter cable for connecting to a meter or PC interface. This fiber adapter is used to connect a rectangular PD300 sensor directly to a standard SC-type fiber. No mounting bracket is necessary. This fiber adapter is used to connect a rectangular PD300 sensor directly to a standard ST-type fiber. No mounting bracket is necessary. This fiber adapter is used to connect a rectangular PD300 sensor directly to a standard FC-type fiber. No mounting bracket is necessary. This fiber adapter is used to connect a rectangular PD300 sensor directly to a standard SMA-type fiber. No mounting bracket is necessary.